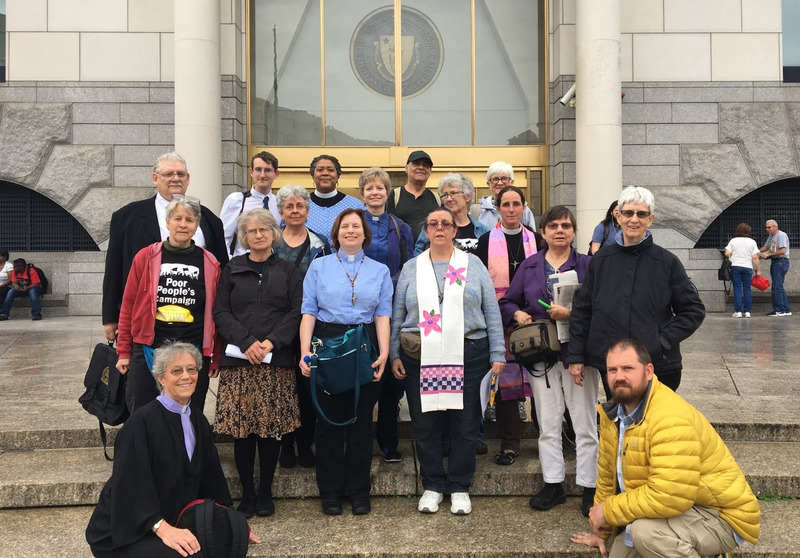 Thank you to all who came out for Monday’s Rally and Sit-in at the State House to address systemic racism, voting rights, immigration justice, Islamophobia and Indigenous rights. We’re so proud of everyone’s hard work and commitment to the movement! 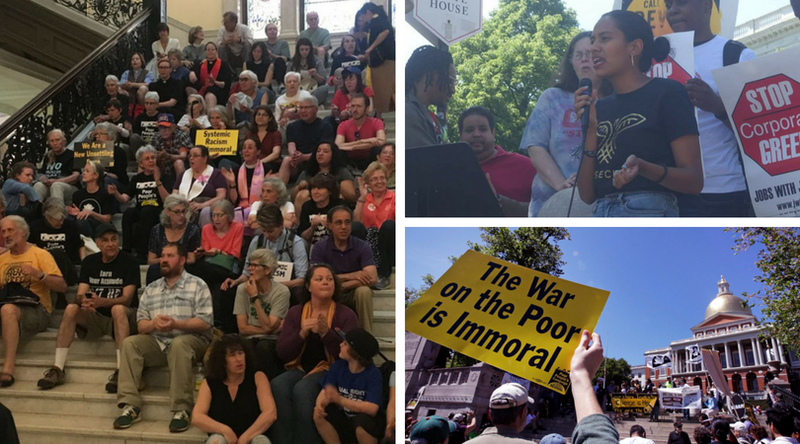 Over 200 of us rallied on the Boston Common, and 16 of us were arrested last night at State House, demanding lawmakers confront systemic racism as the Massachusetts Poor People’s Campaign Intensifies. This morning, all 16 cases were dismissed by the Boston Municipal Court Judge! But our fight is just beginning. Keep the momentum going by joining us at the Boston Common on May 28th and 29th! For Week 3, our theme is The War Economy, Militarism, and Gun Violence. We will start with a Veterans-led War Economy Encampment on Monday (Memorial Day) at noon. OnTuesday, May 29 we’ll hold a rally at 2pm on the steps leading up from Boston Common to Beacon Street across from the State House . Sign up to participate! In Washington D.C., the Rev. 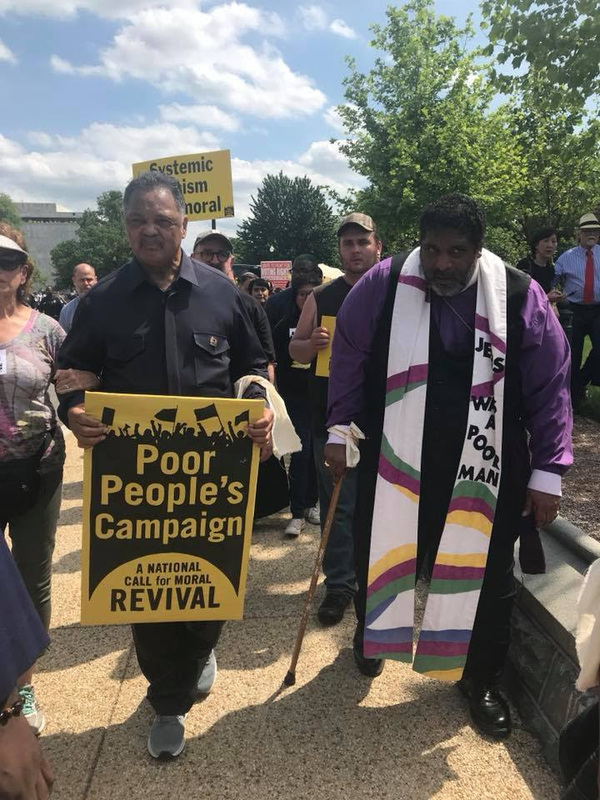 Jesse Jackson, a key leader in the 1968 Poor People’s Campaign, was arrested yesterday alongside campaign co-chairs the Revs. William Barber and Liz Theoharis, poor people, and clergy who packed the U.S. Capitol rotunda and sat in prayer despite orders from the Capitol police to disperse. We got a lot done this week– like delivering our demands on ending systemic racism to the Governor, and leaders of the House and Senate, and conducting a well organized and effective sit-in inside the state house. Our efforts were covered by local media. Some supporters even took these incredible photos. Please join us on the Boston Common on May 28th and 29th! If you RSVP, we’ll send you a reminder email ahead of time and give you instructions on when and where to show up. PS: Be Sure to indicate your interest in doing Civil Disobedience or CD Support as you sign up, or tell us what part of the event you can attend.